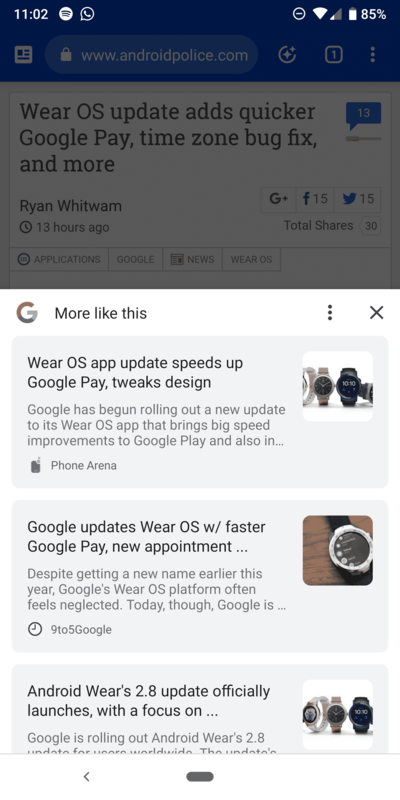 Just like Google has multiple operating systems and messaging apps, they have a bunch of ways to show your article suggestions. There is Google Launcher feed, article suggestions on the Chrome New Tab Page (NTP) and Google News. Now, there is one more. Google has added a couple of flags to Chrome’s Android version to test this new feature. There is chrome://flags/#enable-contextual-suggestions-bottom-sheet and then there is chrome://flags/#enable-contextual-suggestions-button. If you use the Canary version of Chrome for Android, there are a couple of flags that talk about Contextual Suggestions. These things are still in the early stages of development, but the related articles button works. There is a new icon that gets added to the Chrome toolbar. This opens up a list of related articles based on the topic of the article that you are currently reading. Here is how this looks like, screenshots courtesy of Android Police. I couldn’t get this to work, most probably because of all those flags that I have enabled. A browser level “Related Articles”, if you will. Should I consider disabling the Related Articles plugin that I use for my blog?